Located at 41700 State Hwy 38, Camp Tahquitz sits on one square mile (640 acres) of pristine forestland in the Angelus Oaks area of the San Bernardino Mountains. Camp Tahquitz is more than just Summer Camp. You can rent the camp for tent camping or even utilize the cabins and Kiwanis lodge for your unit or group. Make Tahquitz the place to be for your winter camping this year. Spring at Tahquitz is also a beautiful spot to start your year out camping and taking in your first hikes. You can even stay at Tahquitz while you go up to Big Bear for Snow Sports Merit Badge Day! Since opening in 1959, Camp Tahquitz has served hundreds of thousands of youth from greater Long Beach, Southern California, and several western United States, by making available the finest possible camping experience in an incomparable setting. At 6, 500 feet elevation, the camp offers clean air and an agreeable climate amid rolling green meadows, thick forests of cedars, oaks, and pines - including some of the world's tallest Ponderosa Pine trees. Its location offers many spectacular views of the mountains above and the valley below as well as an abundant variety of birds, mammals and other wildlife. The program is varied, offering a wide range of outdoor activities - archery, rifle shooting, rowing; canoeing, climbing & rappelling, nature studies, horseback riding and camp craft, just to name a few. Our location on the edge of the San Gorgonio Wilderness Area offers many opportunities for challenging hikes through the magnificent backcountry and the highest point in Southern California, Mt. San Gorgonio. As adventurers have done since the earliest Native American tribes of Southern California first trekked onto the forested slopes of Mt. 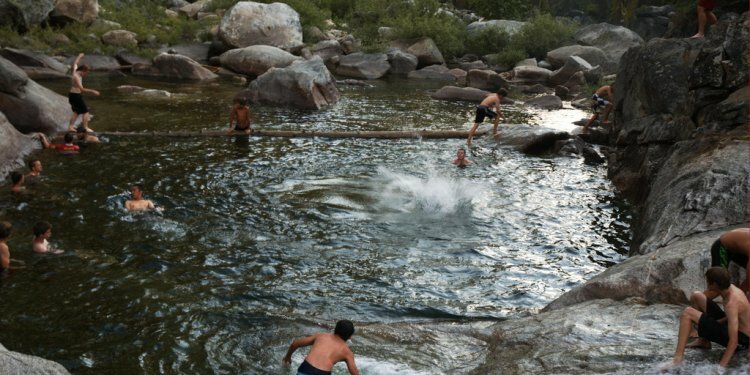 San Bernardino, we invite you to explore the resources and treasures of Camp Tahquitz! Spend a week with us during the summer or come up anytime during the year for off-season mountain experiences.